The thought of paying reverence to rivers instantly brings to mind the worship of the Ganga, especially on the ghats of Varanasi. 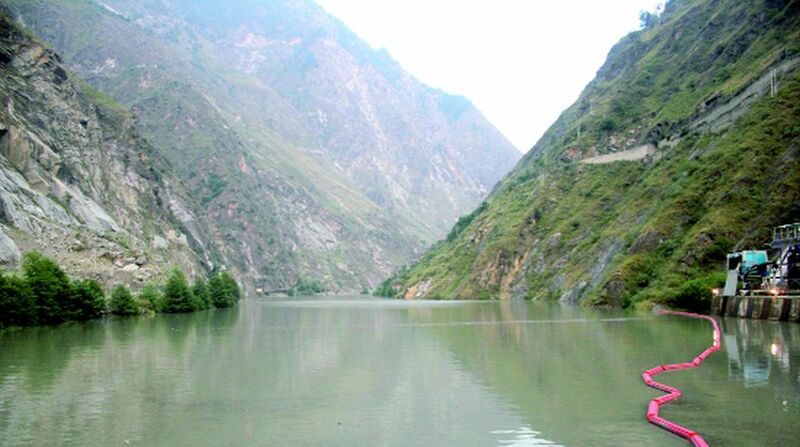 In Himachal, that is blessed with five rivers, a new chapter has been added with the worship of the Satluj as a token of gratitude for the longest river flowing in the state (about 320 km). In what is a first in Himachal, the hydropower company, Satluj Jal Vidhyut Nigam (SJVN) Ltd took the initiative to perform ‘Satluj Aradhana’ on 21 May at the Nathpa dam site of its 1500 MW Nathpa Jakhri Hydro Power Station (NJHPS) as a part of its 31st Raising Day celebration. The NJHPS is SJVN’s first hydro project on the Satluj basin and is Asia’s biggest underground hydro power project. The idea was the brain child of the chairman and managing director of SJVN Nand Lal Sharma, who took over the reins a few months back. He believes that the river has nourished millions of lives and by paying obeisance to the river is a way of thanksgiving to the water source and to inculcate the idea of preserving it. The dam site on the banks of the Satluj at Nathpa on the evening of the worship transcended into a place akin to the ghats of Varanasi. There was a festive air with lights and diyas amid chants of vedic mantras making it a historic occasion. During the ‘Deepdaan’, diyas were floated on the Satluj river which illuminated the place with the spirit of faith and reverence. Five pundits assisted with the same number of pundits from Benaras performed Puja-Archana facing the river. The idea had stemmed from the worship of river Ganga on the ghats of Varanasi, he said, adding that the ‘Satluj Aradhana’ would be made a regular feature in future and efforts will also be made to involve all the power producers operating projects on the river Satluj. “The Satluj River know as ‘Sutudri’ finds mention in the Rig Veda in ancient times. Worship of the rivers is also an essential part of our Indian culture and civilization,” he said. Besides the SJVN family, hundreds of local natives of Nathpa village and surrounding places of Shimla district and Kinnaur were witness to the occasion. The Natpha Jhakri Hydroelectric Station which is also the country’s largest hydropower plant was commissioned in May 2004, when it was officially dedicated to the nation by the then Prime Minister Manmohan Singh on 28 May 2005. The foundation stone was laid by the late Prime Minister Rajiv Gandhi on 13 April 1989. The projects of SJVN Ltd in operation in Himachal alone are Nathpa Jakhri Hydro Power Station 1500 MW and Rampur HPS 412 MW, while survey and investigation are on for Luhri Stage- II HEP, a run of river proposed on Satluj river near Nanj village in Shimla, Kullu and Mandi districts and Sunni Dam HEP which is a run of river type scheme and a part of multi-stage development of Luhri HEP. Besides, pre-construction and investment approval in Luhri stage – I HEP that is also located on the Satluj in Shimla, Kullu, Mandi districts of Himachal Pradesh. Other than Himachal, it also has footprints in hydroelectric projects in other states that include Uttarakhand and in neighbouring countries of Nepal and Bhutan.